Easy to make zippered and quilted purse pattern in two sizes. 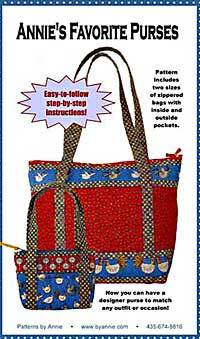 Each purse pattern has instructions for 6 inside and 2 outside pockets. Finished sizes are 12" x 15" x 4" and 8 1/2" x 6" x 2". Patterns by Annie! Border print with at least four 3" x 18" (3 1/2" seam allowance) border strips for large purse: 1/2 yd or fat quarter 2 pieces each 2" x 10 1/2"
Light-weight quilt batting: 20" x 40" 18" x 20"
Heavy-weight fusible interfacing: 12" x 17"
Heavy cardboard: 3 1/4" x 11" 2" x 6 3/4"